The Breakingviews Abenomics Index rose for a second straight month in April as a weak yen prompted exporters to boost production. But domestic consumer demand remained tepid: even with wages starting to improve, the year-long slump in spending shows little sign of easing. 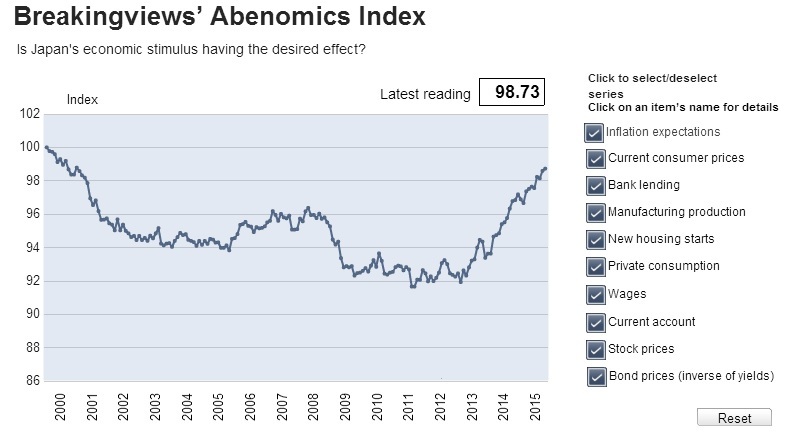 The Breakingviews Abenomics Index, an alternative measure of economic activity, increased for the second straight month to 98.73 in April from a revised 98.60 in March. Among the 10 indicators that make up the composite gauge, seven had better readings. Wages grew; manufacturing production rose; current inflation and inflation expectations strengthened; bank lending increased; and stock and bond prices firmed up. However, private consumption stumbled; new housing starts slipped; and the current account surplus narrowed.